The two a-ha talent grant finalists at tonight’s VG chart concert in Trondheim were Sami joik group Adjagas and indie songwriter Pål Moddi Knutsen – aka Moddi. This time it was Magne’s turn to open the envelope and reveal the winner – which turned out to be Moddi. Moddi has received good reviews for his debut album Floriography, which was released in February 2010, and will be supporting a-ha at Lerkendal Stadium in Trondheim on September 4th. “Moddi has strength and integrity”, Magne says. “Moddi has the balls to face [tonight’s] audience without making any compromises, he just does his own thing. 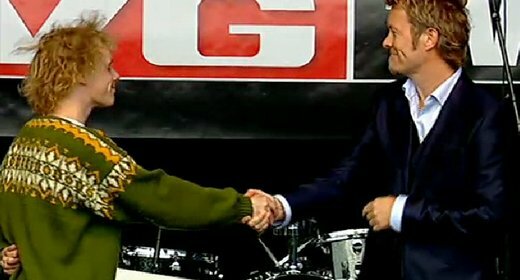 He has strength and integrity“, Magne told VG after the show. 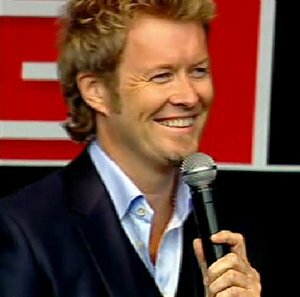 Magne has liked Moddi’s music for several years, and makes comparisons to Damien Rice and The National when he talks about the young songwriter. The final a-ha talent grant will be given out at the show in Bergen on July 14th, where Lars Vaular and Casiokids are the two last finalists. “Every time I step out the door, I’m giving away a million kroner. Now we need to earn more, so we’ll be able to give away even more money next time“, Magne jokingly told VG. “How much is 1m kroner? It’s about £100,000. In other words, A-ha are giving each of four bands a grant worth twice that of literature’s most famous award, the Man Booker prize. It is, as far as we can tell, one of the biggest arts prizes in the world“, Guardian’s Sean Michaels writes in his article.